Students of an Imam Hatip high school in Ankara, Turkey. Turkey has recently been in the news for various developments that include, among other matters, its record number of jailed journalists, the destruction of Kurdish towns and forced displacement of thousands of Kurds, the dismissal or suspension of thousands of government employees for political reasons, the arrest of thousands of citizens for allegedly "organizing" last year's failed coup, the creeping conversion of the Hagia Sophia Basilica-museum into a mosque, and the seizure of Assyrian Christian lands, churches and cemeteries by the government. Evolution will no longer be taught in Turkish secondary schools after being described as a "controversial subject" by the government. The head of the education ministry's curriculum board, Alpaslan Durmuş, said a section on Darwinism would be cut from biology classes from 2019. "We have excluded controversial subjects for students at an age unable yet to understand the issues' scientific background," he told a seminar in Ankara, according to Hurriyet Daily News. So the question naturally arises what exactly will Turkish schoolchildren be taught instead. The answer is "jihad." 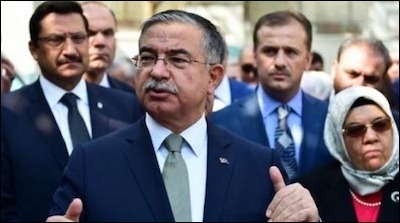 Minister of National education Ismet Yilmaz unveiled new "jihad" curricula in January. Turkey is in the process of including the concept of jihad in compulsory school curricula. According to a statement issued in January by the Turkish Ministry of National Education, Turkish textbooks will be teaching "jihad" as a "value" in classes at Imam Hatip middle schools (schools that offer an Islamic curriculum to pupils). At a press conference, Ismet Yilmaz, the minister of national education, explained the details of the new curricula to the press. According to the newspaper Cumhuriyet, jihad will be taught in seventh grade while pupils study the fundamentals of "tawhid" (oneness of God) and wahdat (Islamic unity) civilization." In eighth grade, jihad will also be taught under the title "Struggling on the Path to Allah: Jihad" under the chapter called "Worshipping Allah." Enrollment in Imam Hatip schools has surged from 60,000 to 1,500,000 since the AKP came to power in 2002. Under Turkish president Recep Tayyip Erdogan's Justice and Development Party (AKP), the number of Imam Hatip schools has ballooned from 500 to 3,500, with enrollment surging from 60,000 to 1,500,000 since the AKP first came to power in 2002. The first Imam Hatip schools in Turkey were opened in 1924 during the rule of the Republic's first president, Mustafa Kemal Ataturk, as vocational schools to train government-employed imams and Islamic scholars. "All schools shall have masjids (mosques)"
The Ministry of National Education has also declared that for schools and other educational centers to be opened in Turkey, they have to have a washroom where people can perform ablution before reciting their prayers [salah] five times a day, as well as two masjids [mosques] -- one for males and the other for females. The Ministry of National Education has also increased class hours for the mandatory course in "religion, culture and morality" and decreased art and philosophy classes to one hour per week. The Ministry also repealed the "Regulations on Fine Arts Education," which were enacted in 2008 "to give primary and secondary school students with special talents the necessary education to prepare them for the fine arts schools." Secularism, positivism "problems of faith"
The new curricula prepared by the Ministry of National Education to be studied at Turkish schools also describe "secularism, positivism, deism, agnosticism, atheism, nihilism, Satanism, reincarnation and false prophethood" as "problems of faith." Turkey seems to be evolving into a Sunni, perhaps more dangerous, version of Iran's Islamic Republic. With more Islamization of the Turkish educational system will come the segregation of women and men and the deterioration of women's rights; more pressure and hostility to non-Muslim communities; more violent anti-Semitism; more anti-Western and anti-Israel bigotry, as well as more sympathy with, and even active participation in, jihad. These developments will automatically create less stability and less safety both in Turkey and throughout the Middle East as well as Europe. Given the political developments in Turkey for more than a decade, the country seems to be fast-forwarding to be the second -- and possibly even a more dangerous version of -- the Islamic Republic of Iran.